Inspired by the quintessential American sport, Christofora’s educational and fun children’s book series can now be read by more children whose rich cultures make up the country’s great melting pot. The values I hope to convey in my books are universal. Though baseball is regarded as an American sport, people all over the world play the game. 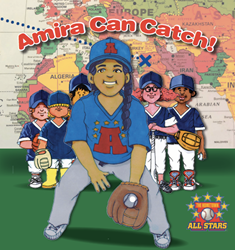 Kevin Christofora has released three titles in the “Hometown All Stars” children’s book series—with a fourth, Amira Can Catch, about a new girl in school who is a Syrian refugee—coming this summer. The fun and educational series has reached countless children already, and it’s showing now signs of stopping. Now, with 11 additional languages, little league players and children who have never played baseball alike can enjoy them, no matter their background. With the “Hometown All Stars” series of children’s books, Kevin Christofora aims to teach children healthy habits, all the while learning about the world around them. Initially available in 13 languages, the 11 additional languages mean the books are even more accessible. Distributed by Midpoint Books, some of the additional languages the series is being published in include: Chinese, Polish, German, Korean, Japanese, Arabic, and Italian. Being available in 24 languages is a perfect complement to the openness and inclusivity Christofora—a father and little league coach—encourages in his readers, as well as his players. While children who play little league will certainly love the books, those who are new to baseball can learn and benefit from them, too. Christofora aims to help teach all children about self-confidence and teamwork, as well as getting active and making healthy choices. The Hometown All Stars series is currently available on Amazon, as well as thehometownallstars.com. The entire series, including all 24 languages, is available through all major distributors, including: Ingraham, Baker and Taylor, and Bogart.